Too many new golfers in New Zealand approach the putting green with a sense of dread. It’s no secret that putting is one of the most difficult aspect of the game. However, ebalongolf.com is here to share some advice that could give you a sense of confidence when on the green. Keep reading, and learn golf putter grips that could make all the difference to your game. The first of the golf putter grips we will look at is known as the Claw. Basically, the thumb of your left hand needs to be placed on the club’s flat top, while your right hand should be a few centimetres away from your left hand, in a relatively passive position. 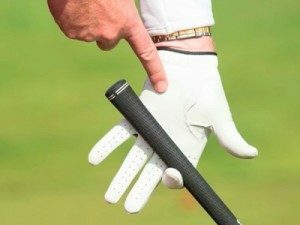 This should improve the pressure with which you grip the putter with your left hand. However, you should ensure that your forearms are parallel to the target line. The second of the putter grips we are sharing with you is called the Prayer, and, no, it does not involve petitioning a deity to guide the ball into the hole. When you hold your putter, your palms should face one another while your thumbs are placed next to one another. Whether you put your left fingers over your right fingers or the other way around is up to you. This is one of the recommended golf putter grips, because it levels your shoulders and improves the curve of your swing. You will need to take note of the size of your putter’s grip, as it might be difficult to position your thumbs alongside one another on a narrow grip. Another suggestion on how to grip a putter is the Left-hand Low. The basic technique sees the golfer positioning their left hand below their right hand on the putter, preferably with both thumbs on top of the putter’s grip. You could either place your right index finger at a right angle to the left fingers, pointing down, or you can rest your left little finger on the right index finger or below it. Of all putter grips, the Left-hand Low is one of the best when it comes to lining up, to keeping a square face, and to keeping your left hand flat. If you use this grip, you need to be aware that the stronger hand will generally be further away from the club head. One of the handiest putter grips to learn is the Arm Lock. If you are right-handed, the putter handle will need to lock against your left inner forearm; if you are left-handed, the handle must lock against your right inner forearm – and this is where it needs to stay for the duration of the stroke. You can combine other putting grips with the Arm Lock. When doing so, you will need to ensure that the putter’s forward angle remains unchanged. If this all sounds far too complicated, you could always consider getting your kicks at golf betting sites instead of on the green.